Migrations are documented database mutations, created throughout your application’s development lifecycle that you can roll back or re-run at any point in time. 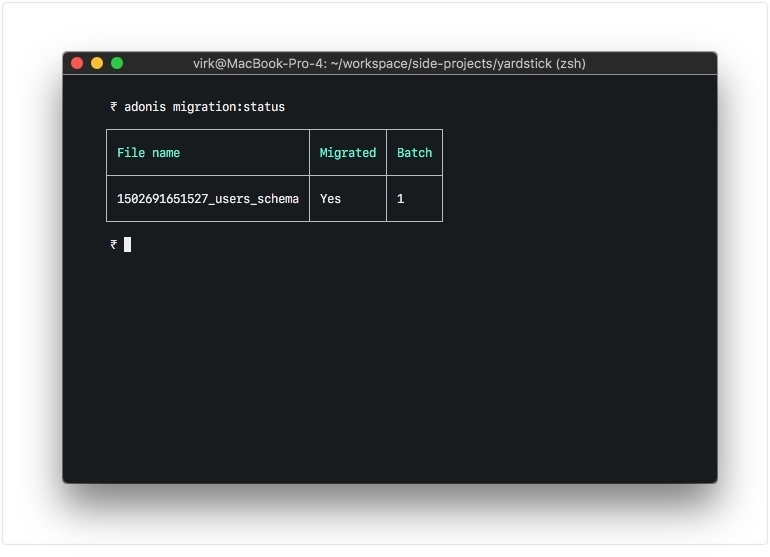 Migrations make it easier to work as a team, enabling database schema changes from one developer to be easily tracked and then applied by other developers in your organization. To use migrations, the Migrations Provider must first be registered inside the start/app.js file’s aceProviders array. Let’s create a users table with the help of migrations. A schema file requires two methods: up and down. The up method is used to take action on a table. It can be used to create a new table or altering an existing table. The down method is used to revert the changes applied in the up method. When up is used to create a table, down would be used to drop that table. The example above demonstrates how to create/alter a database table using schema files, chaining together different column type/modifier methods to define the characteristics of individual field attributes in the up method. For the full list of schema column type and modifier methods, see the Knex API documentation. Adds an auto incrementing column. Set column to be inserted after field. Marks the column as an alter/modify. Set column collation (e.g. utf8_unicode_ci). Set column to be inserted at the first position. Specifies column as an index. Set foreign key table (chain after .references). Set column to not null. Set column to be nullable. Set column as the primary key for a table. Set column to unsigned (if integer). The database table adonis_schema is always created inside the default connection database to manage the lifecycle of migrations (there is no option to override it). The batch value exists as a reference you can use to limit rollbacks at a later time. Calling adonis migration:run runs all pending schema files and assigns them to a new batch. Once a batch of migration files are run, they are not run again. Calling adonis migration:rollback rollbacks the last batch of migrations in reverse order. Don’t create multiple tables in a single schema file. Instead, create a new file for each database change. This way you keep your database atomic and can roll back to any version. Below is the list of available migration commands. Create a new migration file. Rollback last set of migrations. Rollback all migrations to the 0 batch then re-run them from the start. Rollback all migrations to the 0 batch. Get the status of all the migrations. Below is the list of schema methods available to interact with database tables. Below is the list of extension methods you can execute when running migrations. Extensions only work with a PostgreSQL database. Commands written inside the up and down methods are scheduled to be executed later inside a migration. The schedule method receives a transaction object. It is important to run all database commands inside the same transaction, otherwise your queries will hang forever. The schema builder API uses the Knex API, so make sure to read their documentation for more information. Knex has a method called knex.fn.now(), which is used to set the current timestamp on the database field.